Genetic variants of the human genome can differ very much in size. From the smallest ones (variants affecting on single nucleotide: Single Nucleotide Variations – SNVs) to the largest ones (variants affecting the shape and number of an entire chromosome), everything can stay in the middle. Variants comprised between 1,000 bp (1Kb) and 1,000,000 bp (1Mb) are usually referred to as Structural Variations or Structural Variants (SVs). SVs may be consistent with different localization or orientation of the relevant DNA tract or with alteration of the number of copies (Copy Number Variations – CNVs). According to the definition of SVs, several authors refer to CNVs as variations between 1Kb and 1Mb, although the concept of CNV remains very flexible, with some colleagues using it also to describe larger dosage variations at the submicroscopic or chromosomal level. 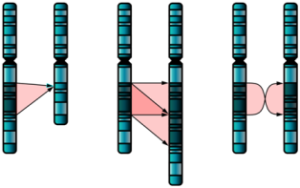 CNVs lead to gain or loss of genomic material and may be caused by deletions, duplications, multiplications or insertions. As such, CNVs may include (part of) one or more genes, with or without clinical consequences such as complex syndromes, disease susceptibility and drug response. CNVs may be acquired or de novo. They are a constitutive part of the human genomic architecture and have been found also in several other mammals, playing a fundamental role in interindividual variability and evolution. Some CNVs are very frequent, showing an allele frequency of more than 1%. Of course such frequent CNVs are not pathogenic and are referred to as CNPs (Copy Number Polymorphisms). At certain genomic loci, some CNVs can show several different alleles. Such CNVs are also called multi-allelic CNVs or mCNVs. Bailey JA, Gu Z, Clark RA, Reinert K, Samonte RV, Schwartz S, Adams MD, Myers EW, Li PW, Eichler EE. Recent segmental duplications in the human genome. Science. 2002 Aug 9;297(5583):1003-7. Bixia X, Fang X, Wenqi Z, Dan Z, Deqiong M. Navigating Web-Based Resources for Genetic Testing of Chromosome Abnormalities, CNVs and Gene Mutations. N A J Med Sci. 2014; 7(4): 163-170. Boettger LM, Handsaker RE, Zody MC, McCarroll SA. Structural haplotypes and recent evolution of the human 17q21.31 region. Nat Genet. 2012 Jul 1; 44(8): 881-5. Gu W, Zhang F, Lupski JR. Mechanisms for human genomic rearrangements. Pathogenetics 2008 Nov; 1(1): 4. Handsaker RE, Van Doren V, Berman JR, Genovese G, Kashin S, Boettger LM, McCarroll SA. Large multiallelic copy number variations in humans. Nat Genet. 2015 Mar; 47(3): 296-303. 1Hastings PJ, Ira G, Lupski JR. A microhomology-mediated break-induced replication model for the origin of human copy number variation. PLoS Genet 2009 Jan; 5(1): e1000327. 2Hastings PJ, Lupski JR, Rosenberg SM, Ira G. Mechanisms of change in gene copy number. Nat Rev Genet 2009 Aug; 10(8): 551-64. Hollox EJ, Armour JA, Barber JC. Extensive normal copy number variation of a beta-defensin antimicrobial-gene cluster. Am J Hum Genet. 2003 Sep;73(3):591-600. Lee JA, Carvalho CM, Lupski JR. A DNA replication mechanism for generating nonrecurrent rearrangements associated with genomic disorders. Cell 2007 Dec; 131(7): 1235-47. Liu B, Morrison CD, Johnson CS, Trump DL, Qin M, Conroy JC, Wang J, Liu S. Computational methods for detecting copy number variations in cancer genome using next generation sequencing: principles and challenges. Oncotarget. 2013 Nov; 4(11): 1868-81. Liu P, Carvalho CM, Hastings PJ, Lupski JR. Mechanisms for recurrent and complex human genomic rearrangements. Curr Opin Genet Dev 2012 Jun; 22(3): 211-20. Lovett ST. Encoded errors: mutations and rearrangements mediated by misalignment at repetitive DNA sequences. Mol Microbiol 2004 Jun; 52(5): 1243-53. Lupski JR, Stankiewicz P. Genomic disorders: molecular mechanisms for rearrangements and conveyed phenotypes. PLoS Genet 2005 Dec; 1(6): e49. Malhotra D, Sebat J. CNVs: harbingers of a rare variant revolution in psychiatric genetics. Cell 2012 Mar; 148(6): 1223-41. Mikhail FM. Copy number variations and human genetic disease. Curr Opin Pediatr. 2014 Dec; 26(6): 646-52. Payen C, Koszul R, Dujon B, Fischer G. Segmental duplications arise from Pol32-dependent repair of broken forks through two alternative replication-based mechanisms. PLoS Genet. 2008 Sep; 4(9): e1000175. Redon R, Ishikawa S, Fitch KR, Feuk L, Perry GH, Andrews TD, Fiegler H, Shapero MH, Carson AR, Chen W et al. Global variation in copy number in the human genome. Nature 2006; 444(7118): 444-54. Scherer SW, Lee C, Birney E, Altshuler DM, Eichler EE, Carter NP, Hurles ME, Feuk L. Challenges and standards in integrating surveys of structural variation. Nat Genet. 2007 Jul; 39(7 Suppl): S7-15. Sneddon TP, Church DM. Online resources for genomic structural variation. Methods Mol Biol. 2012; 838: 273-89.
van Binsbergen E. Origins and breakpoint analyses of copy number variations: up close and personal. Cytogenet Genome Res 2011; 135(3-4): 271-6. Posted in Academia, Last Update, Medical Genetics, Molecular Biology and tagged CNP, CNPs, CNVs, SNV, SV, SVs.